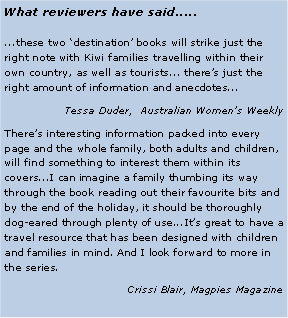 "Destination Auckland, New Zealand for children by freelance photographer Darryl Torckler and writer Gillian Torckler." All of this website content is subject to copyright. Infringements will be taken seriously. An unbiased book for families and tourists on New Zealands biggest city, Auckland. Which is full of fun activities for families with children. This book include information on the history and geography of the area as well as the top activities and cool and interesting facts. There are Maori legends explaining the formation of the area, and the naming of the volcanoes that feature so strongly in the area. For the first time, we have a comprehensive guide book to the Auckland area which features family-focused ideas. It is full of fun and colourful pictures and is written for children to read themselves. Use it to prepare for a trip, or give it to the children to read themselves in the back of the car. And remember, there is a special section of FREE activities. Once we had children, we realised that the information and tourist books for families are very limited. It was almost impossible to find a single source of information that was unbiased—most of what we found was prepared by the companies themselves! Or they paid for ads in other publications. We took our children and tested all of the adventures we could find. We explored the meaning behind the Maori place names and learned about both the Maori and European history of New Zealand's largest city. Along the way, we took lots of photos of our family (and our friends’ families) enjoying all that Auckland had to offer.